Welcome to Fabulous Floors Magazine Blog; we’re excited we have a new way to communicate with the floor covering community. Hello again, some of you may or may not know me, my name is Margo Locust, and am the Publisher at Fabulous Floors Magazine. Founded in 2003, by flooring industry innovator and vanguard Sonna Calandrino, Fabulous Floors publishes quarterly and is the first consumer magazine devoted solely to flooring styles as a key design element in home decor. For years articles about flooring were always part of a home decor article or often never mentioned. Flooring is one of the major design elements of a home and provides the backdrop for everything else in the house. Nothing covers more of a home than the floor covering. From the beginning I worked at the magazine and was responsible for building the Fabulous Floor Magazine brand and working with our customers. Prior to joining the magazine, I worked in floorcovering, both residential and commercial. It’s like a dream come true to be at the helm and carry the legacy of such a wonderful publication and provide valuable information to an industry I love. 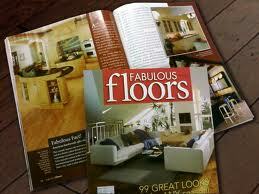 FABULOUS FLOORS reports current, concise and useful consumer-oriented information. Topics cover the latest trends in design and color, as well as features and benefits of many different flooring choices. Each issue offers installation tips and guides on different flooring categories, providing consumers and retailers with important information.Look for wonderful articles by leaders in the field of design and trends as well as product innovations. We know our coverage is on the mark. How? We continue to ask our customers, attend valuable trade shows and keep up on the trends. Our research team conducts extensive field studies and we listen to our readers feedback. This year we will conduct focus groups, consumer panels, on-line surveys about consumer preferences and shopping habits. We continue to expand our reach, building more connections with industry experts and the consumer. If you would be interested in holding a focus group in your city, let us know. Each issue features articles on interior decor, specifically as it relates to carpet, laminate, area rugs, vinyl, tile, wood, resilient flooring, luxury vinyl tile, wool, eco-friendly floors and we’ve added a section on walls. We continue to update “green solutions” and are members of the United States Green Building Council local chapter in upstate New York. We work closely as a flooring resource with Sage College of Interior Design in Albany, New York. Beginning with the Fall 2011 issue, I am looking forward to refining our editorial concept, diversifying our distribution, developing web and social media which will provide an even greater flooring and home decor presence in the marketplace.I look forward to your ideas for our magazine so we can continue to look fresh and on the cutting edge of design. We are excited about our social media campaign spearheaded by our Associate Publisher, Lisbeth Calandrino. Lisbeth, a long time member of the flooring industry and one of the original founders of Fabulous Floors magazine, and is best noted for her speaking and training. She will be organizing Fabulous Floors events for retailers, distributors and manufacturers who are interested in introducing their business to the architect and design community. We have been filling new niches by providing custom publishing pieces for many in the industry. We can be seen and heard from at industry trade shows, you can follow us on Twitter, @fabulousflormag. Our next event will be at Coverings,The Ultimate Tile + Stone Experience on April 17-20, in Orlando, Florida. Look for our special events with the ASID community. We are proud to continue the tradition of our partnership with the ASID community and follow in the foot steps of our late publisher, Sonna Calandrino who in 2010 was voted ASID Industry Partner of the Year. In 2012, Sonna Calandrino will be inducted into the World Floor Covering Hall of Fame. We can be followed on Fabulous Floors Magazine Facebook, Twitter @fabulousflormag and join us on LinkedIn. And don’t forget to sign up for our blog. Fabulous Floors Magazine, LLC, A Limited Liability Company, will maintain its presence in Georgia and production will continue in New York. We are members of the Greater Dalton Chamber of Commerce in Dalton, Georgia and continue to be active in the flooring community. We want to hear from you so stay in touch.